23/Al-Mu'minun-1: The believers have indeed reached Salvation. 23/Al-Mu'minun-2: The believers have indeed reached Salvation. 23/Al-Mu'minun-3: And who stay away from what is vain. 23/Al-Mu'minun-4: And who are givers of alms (Az-Zakat). 23/Al-Mu'minun-5: And who guard their chastity. 23/Al-Mu'minun-6: Except before their mates or those whom their right hands possess (their concubines), for that they surely are not blamed. 23/Al-Mu'minun-7: But who ever seeks to go beyond that, these are they that exceed the limits. 23/Al-Mu'minun-8: And those who are the keepers (loyal ones) of their trusts and their covenants. 23/Al-Mu'minun-9: And those who guard (continue) their prayers. 23/Al-Mu'minun-10: These are they who are the heirs (inheritors). 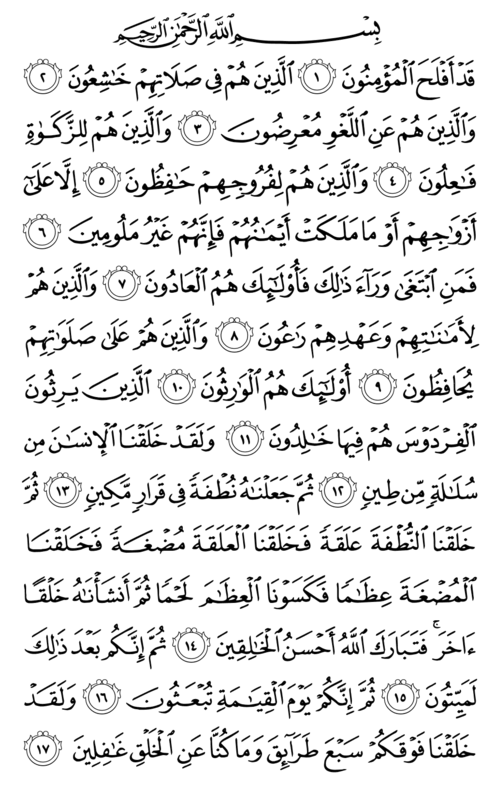 23/Al-Mu'minun-11: They shall inherit the heavens of Firdaus, where they shall abide forever. 23/Al-Mu'minun-12: And certainly We created human out of an extract of clay (organic and inorganic damp earth). 23/Al-Mu'minun-13: Then We made him a Nutfah (small seed), in a firm resting place. 23/Al-Mu'minun-14: Then We made from a Nutfah (small seed) an “Alaqah” (what is hung on to the wall of the womb from one point), then We made the “Alaqah” into a little lump of a chewy flesh, then We made bones out of that chewy flesh, then We clothed the bones with flesh and then We built (shaped) it with another creation. This is how Blessed is Allah, the Best of the creators! 23/Al-Mu'minun-15: Then after that you will most surely die. 23/Al-Mu'minun-16: Then surely on the Doomsday you shall be resurrected. 23/Al-Mu'minun-17: And certainly We have created above you seven paths and never are We heedless of Creating.